The Vanished Land is the Western District of Victoria stripped of its identity, its social elite of grazing dynasties departed for their own reasons. This melancholy exodus has increased recently as the myriad pressures of holding inherited land have become intolerable in a nation never intimidated by ditching its past. No longer is the Western District home of a ruling class that for 150 years bestrode an Australia riding on the sheep’s back. 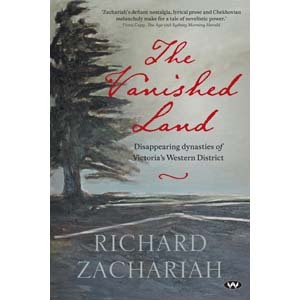 The Vanished Land is a human tale of leaving, of a disconnect with the land, of submerged anguish and inhibited grief, a private story of loss told for the first time by an outsider with insider connection.